Is this strange creature in Texas a wild mutant Coyote - Wild Dog - Wolf _ Xolo or the face of the legendary El Chupacabra in the photo above? Many Texans including myself have taking to actually hunting for these elusive creatures on a daily basis. Whether it be a hybrid or a sickly diseased coyote the search and classification processes's has finally actually begun. Cryptid hunting chupacabra groups seem to be springing up all across the State. Many rooted from those that hunt for Bigfoot to those that search for the elusive Thunderbirds. Attentions have turned to the Texas Blood suckers since the actual carcasses have made the news so often in recent years. Many believe that these resent discoveries are Xolo dogs a native to Mexico, and a wild dog or Coyote mixed breed. At the 2009 Paranormal Symposium in Angel Fire, NM, “Monster Hunter” Nick Redfern explains that the American chupacabra is real. It’s just not a chupacabra that so many believe to be the strange alien like creature often described. The most common description of Chupacabra from other parts of the world describe it as being is a reptile-like being, appearing to have leathery or scaly greenish-gray skin and sharp spines or quills running down its back. This form stands approximately 3 to 4 feet (1 to 1.2 m) high, and stands and hops in a similar fashion to a kangaroo. Another description of Chupacabra, although not as common, describes a strange breed of wild dog being documented in the great Sate of Texas. This form is mostly hairless and has a pronounced spinal ridge, unusually pronounced eye sockets, fangs, and claws. It is claimed that this breed might be an example of a dog-like reptile. Unlike conventional predators, the Texan species of chupacabra is said to drain all of the animal's blood (and sometimes organs) through a single hole or two holes. Some will tell you they are just mangy hairless coyotes. Others think they are a strange cross between something wild and something once domestic. Though the Texas chupacabra legend just might be related to the old Galveston Campeche Hounds of Hell. Others will tell of them as being similar to the legend of the dreadful black dogs of Dallas or the supposed feral pack that haunts the highways and byways of the state known simply as the Ghost Pack. In at least one sighting that has come to light, the creature was reported to hop 20 feet (6 m). This variety is said to have a dog or panther-like nose and face, a forked tongue, and large fangs. It is said to hiss and screech when alarmed, as well as leave behind a sulfuric urine stench. When it howls or makes noise it is more like a high pitched screeches, some reports assert that the chupacabra's eyes glow an unusual red, yellow or orange which in some cases have been known to give the witnesses nausea. To date a few rotting carcases have been found and displayed but no one actually believes this to be the actual real blood sucking beast that el chupacabra has been associated with. The Texas creature as many call it, is more canine then mystical, and DNA testing often results in telling us that it is a hairless domestic dog, wolf or coyote mix. Dog is the common use term that refers to members of the subspecies Canis lupus familiaris. The term is sometimes used to refer to a wider range of species: it can be used to refer to any mammal belonging to the family Canidae, which includes wolves, foxes, jackals, and coyotes; it can be used to refer to the subfamily of Caninae, or the genus Canis, also often called the "true dogs". Some members of the family have "dog" in their common names, such as the Raccoon Dog and the African Wild Dog. A few animals have "dog" in their common names but are not canids, such as the prairie dog and the dog fish. Dogs with dominant genes for hairlessness can pass their attributes to their offspring in natural conditions, that is, not under the control of humans. Therefore, it is possible that, in some parts of the world, groups of hairless dogs came into existence without human intervention. Later in history, people developed these groups into a recognized breed. Worldwide recognized breeds at this time are the Chinese Crested Dog, the Mexican Hairless Dog, and the Peruvian Hairless Dog. The American Hairless Terrier is recognized only in some parts of North America, and is the only breed whose hairlessness is a recessive genetic trait. Other breeds that were said to have existed in the past were the Hairless Khala, African Hairless Dog (also known as the Abyssinian Sand Terrier, Egyptian Hairless Dog and Elephant Dog, the last being a reference to its grey skin) and the Thai Hairless Dog. This type of genetic structure is said to be homozygous pre-natal lethal for the dominant gene. This means that zygotes with two dominant genes cannot live. Therefore, all dominant-hairless dogs have a heterozygous gene structure. This allows a homozygous recessive type to persist, which is the coated variety. For dogs where hairlessness is a dominant gene, hairless to hairless matings will on average produce 66.6% hairless and 33.3% coated puppies. For hairless to coated matings, there will be an average of 50%/50% coated to hairless ratio, while for coated to coated matings, all puppies will be coated. The Chinese Crested coated variety is called "Powder Puff", and is a recognized type. For the other breeds coated varieties are called "coated" and are not recognized as valid varieties for conformation showing. The Mexican Hairless Dog is a rare, hairless breed of dog whose size varies greatly. It is also known as Xoloitzcuintli, Xoloitzcuintle (in English pronounced /ʃoʊloʊiːtskwiːntli/ show-low-eats-quint-lee), or Xolo for short, or Mexican Hairless. The breed ranges in size from about 10 pounds/4 kg to 50 pounds/20 kg. Contrary to popular myth, the breed does not have a higher than normal body temperature, does not sweat through its skin and contact with a Xolo cannot heal injuries or illness. These myths are based in the breed's traditional ceremonial use. Similar in appearance to a Pharaoh Hound, with a sleek body, almond-shaped eyes, large bat-like ears, and a long neck, the Xolo is notable for its dominant trait of hairlessness. The dominant hairless trait originated in this breed as a spontaneous mutation thousands of years ago. The recessive expression of the trait will produce a coated variety, which is genetically inseparable from the hairless. Most litters contain both hairless and coated puppies. The coated variety, covered with a short, flat dense coat represents the original form of the dog, prior to the occurrence of the spontaneous hairless mutation. The hairless variety is completely hairless on the body. Some dogs exhibit a few short hairs on the top of the head, the toes and tip of the tail. Most hairless dogs are black or blue in color. According to standard genetic ratios, one out of every four puppies should be born coated. The allele responsible for the xolo's hairlessness also affects the dog's dentition: xolos typically have an incomplete set of teeth. The Xolo is native to Mexico, Central and South America and the Caribbean. Archaeological evidence shows that the breed existed in the New World for more than 3,500 years. 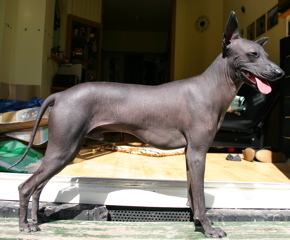 Most likely, early forerunners of the Xolo originated as spontaneous hairless mutations of indigenous New World dogs. Hairlessness may have offered a survival advantage in tropical regions. Their value in ancient native cultures is evidenced by their frequent appearance in the art and artifacts produced by the Colima, Aztec and Toltec civilizations in Mexico. Xolos were considered sacred dogs by the Aztecs because they believed the dogs were needed by their masters’ souls to help them safely through the underworld. According to Aztec mythology, the god Xolotl made the Xoloitzcuintle from a sliver of the Bone of Life from which all man was made. Xolotl gave this gift to Man with the instruction to guard it with his life and in exchange it would guide Man through the dangers of Mictlan, the world of Death, toward the Evening Star in the Heavens. The Aztecs also raised the breed for their meat. 16th Century Spanish accounts tell of large numbers of dogs being served at banquets. When Columbus arrived in the Caribbean in 1492 his journal entries noted the presence of strange hairless dogs. Subsequently, Xolos were transported back to Europe. Despite the Xolo's 3000+ year history in Mexico the breed did not receive any official notice there until the 1950s. The FCM, founded in 1940, was not prepared to declare the Xolo an official purebred at that time. According to breed historian, Norman Pelham Wright, author of The Enigma of the Xoloitzcuintli Xolos began to turn up at Mexican dog shows in the late 1940s. While it was recognized that these were indigenous specimens of a native breed, interest in them was minimal at that time. Information was scarce and no standard existed by which to judge them. Within a decade the FCM realized that the breed would be extinct if drastic action were not taken to save it. This led to the widely publicized Xolo Expedition of 1954. With the official sanction of FCM, Wright and a team of Mexican and British dog authorities set off to discover if any purebred Xolos still existed in remote areas of Mexico. Eventually ten good Xolos were found and these dogs formed the foundation of Mexico's program to revive the breed. A committee headed by Wright authored the first official standard for the breed and on May 1, 1956 the Xolo was finally recognized in its native land. And, while being a member of the FCI, worldwide too. Even today many people in Mexico believe this breed to have healing qualities. Some cultures ate the meat of the Xoloitzcuintli for ritual or medicinal purposes, and the meat may still be found for sale in some parts of rural Mexico. Laws concerning Animal Rights in the country controls this situation harshly. Xolos were among the first breeds recorded by the American Kennel Club. A Mexican dog named Mee Too made breed history as the first AKC registered Xolo in 1887. Chinito Junior, bred and owned by Valetska Radtke of NYC became the breed's first and only AKC champion to date. He earned his title on October 19, 1940. In 1959 the Xolo was dropped from the AKC studbook due to the breed's scarcity and perceived extinction. The Xoloitzcuintli Club of America was founded in October 1986 to regain AKC recognition for the breed. On May 13, 2008 AKC voted to readmit the breed to its Miscellaneous Class starting January 1, 2009. The XCA is the official parent club for the breed, founded on October 26, 1986 for the purpose of regaining AKC recognition for the Xoloitzcuintli. The founding members voted unanimously to recognize all three sizes (toy, miniature and standard) and both varieties (hairless and coated) at their initial meeting. Since then, the XCA has compiled a studbook modeled on requirements for eventual AKC acceptance, held an annual independent specialty show, published a quarterly newsletter, The Xolo News, and maintained an active national rescue network, The Xolo Rescue League. As of January 1, 2007, FSS registered Xolos are eligible to compete in AKC performance events. In recent news, there is a story about a Texan who poisoned a creature identified as possibly being the mythical Chupacabra (Spanish for "goat sucker"). Images and video are available that show the animal resembles a Xolo. There is controversy around the sensationalism of the stories since many view the reporting as being poorly researched. It is possible, given the temperament of the Xolo breed, that escaped domesticated Xolo's and/or Xolo, coyote hybrids are the "mythical Chupacabra". Numerous news clips over the last few years have shown the, almost always dead, animal. These animals bear a striking resemblance to a Xolo, or a, similar breed, the Peruvian Hairless dog. DNA testing would be required to positively ID the animal breed. The Xolo is essentially a natural rather than a manmade breed, formed in response to natural rather than artificial selection. It is moderate in all aspects of its appearance, conveying, strength, agility and elegance. Xolo body proportions are rectangular, slightly longer in total body length than the height measured at the highest point of the withers. The breed occurs naturally in two varieties, hairless and coated. Hairless Xolos are the dominant expression of the heterozygous Hh hairless trait. Coated Xolos (hh) are the recessive expression. Breeding hairless to coated or hairless to hairless will invariably produce pups of both varieties. Breeding coated to coated will only produce coated pups because they are recessive to the hairless trait and do not carry the dominant H gene. Both varieties occur in all colors, solid, marked, splashed or spotted. The most common colors are various shades of black, blue, and red. The breed occurs in a range of sizes, which breeders have standardized into Toy (ten to 13 inches in height, weighing approximately 12 pounds) Miniature (13 to 18 inches in height, weighing approximately 25 pounds) Standard (18 to 24 inches in height, weighing approximately 45 pounds) The Xolo has been mistaken for the mythical Chupacabra of Mexico. Adult Xolos are noted for their calm demeanor but puppies can be quite noisy and unruly. The breed has definite primitive temperament traits and requires extensive socialization and training from eight weeks to a year of age. Xolo temperament can be compared to a typical Working breed, with strong guardian instincts. Their primitive heritage also encourages predatory behavior. Xolos can be escape artists, climbing and jumping fences to chase small animals. They are known to possess exceptional guard dog ability and will not back down from a fight. Therefore, basic obedience training and continued socialization is needed until adulthood. 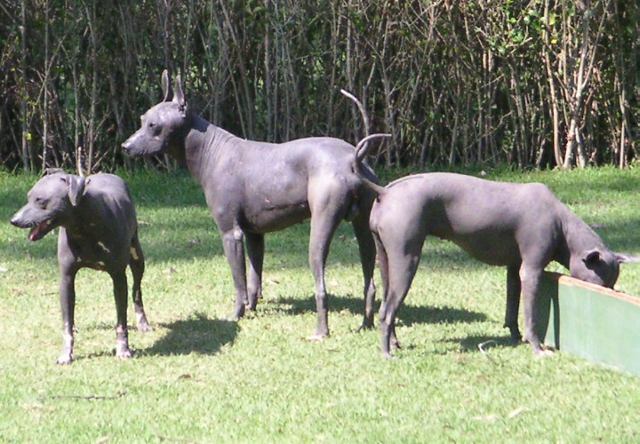 Hairless and Coated Xoloitzcuintles side by side. The Peruvian Hairless Dog is a breed of dog with its origins in Peruvian pre-Inca cultures. It is one of several breeds of hairless dog. It is not to be confused with the Xoloitzcuintli. According to the FCI breed standard, the most important aspect of its appearance is its hairlessness. The dog may have short hair on top of its head, on its feet, and on the tip of its tail. In Peru, breeders tend to prefer completely hairless dogs. The full-coated variety is disqualified from conformation showing. The color of skin can be chocolate-brown, elephant grey, copper, or mottled. They can be totally one color or one color with tongue pink spots. Albinism is not allowed. The eye color is linked to the skin color. It is always brown, but dogs with light colors can have clearer eyes than darker-skinned dogs. The smallest weighs from 4 kg (9 lb) and the largest up to 25 kg (55 lb). The dogs should be slim and elegant, with the impression of force and harmony, without being coarse. The ears should be candle-flame shaped and erect with the possibility to lay flat. Proportions of height (at withers) to length (withers to base of tail) are 1:1. The lack of hair leads to a reputation for being clean, for being easy to wash with a sponge, and for a natural lack of fleas or other parasites. Despite this, the dog needs care, but in another way. The skin should be washed from time to time to remove dirt and prevent clogging of pores. Some dogs are prone to have acne or at least blackheads. The skin sometimes becomes too dry and can then be treated with moisturizing cream. Protection against sunlight is necessary on lightly coloured/white dogs. On them sun-block might need to be used to prevent sunburn. Protection against cold may be necessary when the dog is not able to move around at its own speed and under adverse weather conditions. Sensitivity to cold may vary from dog to dog. Smaller dogs seem to be more sensitive to the cold than their larger counterparts. The rims of the ears need special attention as they can become dry and cracked easily. The genes that cause hairlessness also result in the breed often having fewer teeth than other breeds, mostly lacking molars and premolars. One theory is that the hairlessness trait is recessive-lethal, which means that homozygotic hairlessness doesn't exist. This results in an average birthrate of 2:1, hairless : coated. According to Hans Räber "Enzyklopädie der Rassehunde" T.I 25% of the population is born coated. While they are recognized by the KFC for its Foundation Stock Service as Peruvian Orchid dogs, they cannot be shown at AKC shows, they are also registerable with FCI, UKC, NKC,APRI, ACR. Some breeders think that interbreeding with coated (Peruvian) dogs is required to maintain functional teeth and nervous system health in subsequent generations. They say that breeding of hairless with hairless (and common but unacknowledged culling of hairy pups from litters to maintain a "pure" image) leads to short-lived dogs with serious health problems. However, other breeders (especially in Peru) think the opposite and are doing well (for centuries already), too. Breeding hairless to hairless increases the chance of congenital defects in litters. El Chupacabra, a legendary blood-sucking cryptid investigations, research, books and info. Chupacabra's and Other Mysteries is a nonfiction work by a veteran bilingual researcher who answers the public outcry for more information on the "goat sucker" that has been mutilating animals and terrorizing the residents of Puerto Rico and other countries around the Gulf of Mexico, and about UFO encounters, government cover-ups, shape shifters, Bigfoot, and other mysteries. Photo section, notes, bibliography, index. EL CHUPACABRA,stories, photos, Paranormal Investigation, urban legends. el chupacabra, pictures, photos, downloads, desktop, background photograph new orleans grunch. el chupacabra, pictures, Goat Sucker, photos, downloads, desktop, background photograph new orleans grunch. Aug 8, 2008 ... cryptids, bigfoot, chupacabra, tasmanian tiger, lochness monster, yowie. EL CHUPACABRA,stories, photos, Paranormal Investigation, urban legends, BOOKS AND MORE.